I start by soaking beans in water for about 5- 10 minutes. Then I put it in a blender and pulse for a few seconds. Don’t worry the blender doesn’t grind it. It just takes the skin off. When I have peeled all of the beans, I put it in a large bowl and pour water into the bowl, above the level of the beans. The skins float and I drain them using a colander. I repeat the process until the beans are free of the outer skin. I crush the beans into a slightly grainy paste using my fantastic blender. I add in all other ingredients and mix. And by all other ingredients, I mean, palm oil, salt and water. Now is the time for wrapping! Ideally, warmed plantain or banana leaves are used. I use banana leaves and foil paper. But if you can’t find banana leaves, just use foil paper, preferably the non-stick one. To get eight cups of soaked beans for this recipe, soak four cups of dried beans. For a smaller quantity of koki beans, halve the recipe if you so wish. Pour the ground beans into a large bowl. Lightly warm the palm oil. Do not bleach it. Set aside. Add salt into bean paste and mix, using an egg whisk so you can trap in air. This makes for a spongy texture. Add oil into the bean paste while whisking continuously. Mix until the oil is well incorporated. At this point, taste to ensure that it is well salted. It should taste slightly more salty than it should be. When it cooks, the taste will balance up. Prepare your banana leaves for wrapping by warming them over a flame or immersing them in hot water. Wash them thoroughly and cut into rectangles. If using just aluminum foil, no need to do this. Wrap the koki by placing foil paper cut into a rectangle in a small deep bowl. The part right above the bowl should be lightly pressed to fill the bowl. Add on banana leaf cut into a rectangle or another foil paper. Pour in one cup of the bean mixture. Then wrap by bringing together all the edges of the inner foil paper or banana leaf then equally bringing together the edges of the outer foil paper to form a bundle. Place the bundle into a pot lined with foil paper or banana leaves. Pour in two cups of hot water, cover all the wraps with more foil paper then bring to a boil. After about 15 minutes, add in about 1-2 cups of water. Let it cook for 1 1/2 to 2 hours. Be sure to check from time to time so it doesn’t burn. Unravel a bundle and serve warm with boiled ripe plantains or any starchy side of choice. Let’s move to the Central region of Cameroon!. Today let’s cook one of their favorite dishes called ”OKOK”. Gnetum spp is a sub-spontaneous liana in forest fallows. Many refer to the Gnetum spp leaf as Eru or Okok meanwhile those are actually dishes made out of those leaves. Yeah i know it’s a little bit confusing but just note this; we use the Gnetum spp leaf to cook Eru and Okok! The leaves of Gnetum spp are used as a disinfectant for wounds. Gnetum spp is used to treat hemorrhoid. The fresh leaves are crushed and used to neutralize the effects of alcohol. The “Bulu” use the leaves to treat cold. The leaves of Gnetum spp increase blood production in the human organism. These leaves are also used for the treatment of the spleen. Concerning the ground groundnut, it should be fried in a skillet or pan for about 10mins then grind it. It should not be ground till its a paste! The Gnetum spp leaves, after cooked with the palm nuts, should be kept in a colander. Wash the palm nuts well. Put it in a big pot and cook for about 10mins. Put your Gnetum spp leaves in a plastic bag and add it to your palm nuts in the pot. leave it to get cooked for about 25mins. When it’s ready, pound your palm nuts in a mortar in order to extract its juice. When you have extracted the juice, put in a pot (medium or big, depends on the quantity you wish to cook) and let it boil for about 20mins. Add your ground groundnut, salt and crayfish (optional) in the pot and mix it to be homogenous. Leave it to get cooked till you notice your groundnut is ready (there’s no specific period for its cooking, just keep tasting until you notice the groundnut is ready). Add your Gnetum spp leaves bit by bit into the mixture till it suits you. Turn or mix it well and leave it to cook for about 30mins. Some may add sugar in order to have this saltishly-sweet taste (Yeah i think i just created that expression:) Taste it until it suits you. Usually eaten with Bobolo or cassava:) Serve Hot!!! Njama Njama (that’s how it is called in Cameroon) is one of the most popular and favorite vegetables in Cameroon especially in the North West Region. Sometimes referred to as huckleberry. Its scientific name is Solanum scabrum. Whiten the palm-oïl in a medium-size pot. When heated, add the chopped tomatoes and the spices (onions, pepper etc) in the heated palm-oïl and stire for it not to burn while getting cooked. As the spices and the tomatoes are getting ready, you can add your tablespoon bouillon powder or Maggie cube plus salt. Taste it so as to reach your desired taste. Add the vegetables in the mixture and stire then you can close the pot for it to steam well. Let it stew for about 10mins then you put off the fire. Usually eaten with fufu-corn or ripe plantains. Serve Hot! 1. Heat the oil in a skillet.Add the oil or butter to the skillet and heat over medium-low to medium heat. Give it a minute or two to heat up, but do not wait for it to start smoking. Use butter if you want to create a richer, more dessert-like plantain dish. Use oil if you plan to serve the plantains as a side dish. Olive oil, safflower oil, corn oil, and coconut oil are all good options. 2. Peel and slice the plantains. Remove the skin and divide the plantains into slices or halves. Cut the plantains into 1/4-inch (6.35-mm) slices if you plan on frying them and serving them without additional seasonings or sweeteners. 3. Sauté the plantains until browned. Add the plantains to the skillet and fry for 2 minutes or until golden-brown on the bottom. Flip with a spatula and Sauté the other side for an additional 1 or 2 minutes. Arrange the plantains in a single layer inside the pan to ensure even browning. 4. Remove the plantains from the heat. Drain the oil from the plantains by using a colander or paper towel. 5. Serve hot. Fried plantains should be eaten immediately for the best flavor. 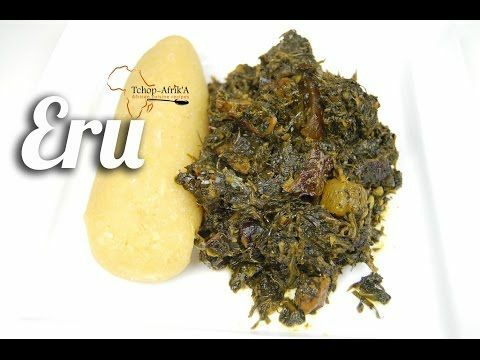 Eru is an African wild vegetable. Eru is the common name used for two very similar vines of the species Gnetum africanum and Gnetum buchholzianum. Eru leaves are eaten raw, or added to soups, fish and meat dishes. Both species of eru are nutritious and an important source of protein, minerals etc. This post explains how us Cameroonians cook Eru. · Make sure your eru is well sliced. That is, in small pieces and washed in clean. It must be washed in a lot of much water to remove sand. 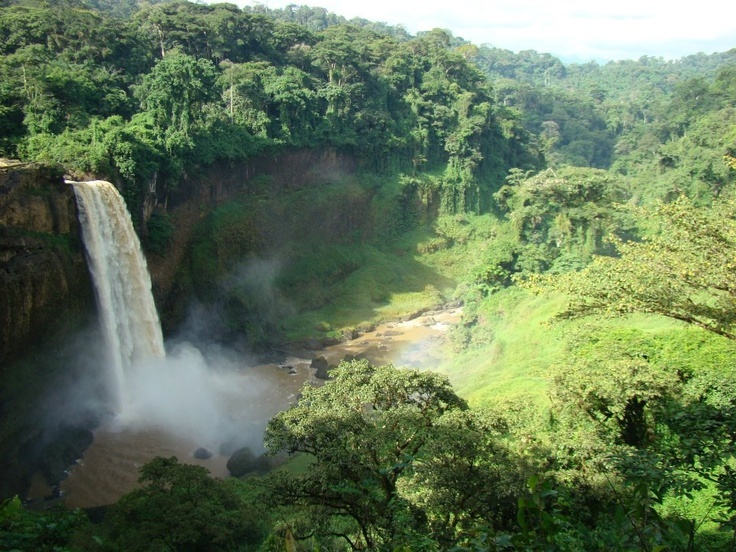 · Eru was an obscure forest food for a long time in Cameroon and the Democratic Republic of Congo (DRC). Originally consumed by Cameroon’s forest-dwelling Bayangi people, eru is now one of Cameroon’s most widely consumed vegetables. Hundreds of tons of eru are exported every week to Nigeria where it is known as okazi and overseas for consumption by Central and West Africans living abroad. · The palm oil should be of good quality, red and with no smell. · Eru has traditional non-food uses as well. In Nigeria, the leaf of Gnetum africanum is used in the treatment of an enlarged spleen, and sore throats. In DRC, it is used for nausea and in an antidote for poison from traditional poison darts. In Congo-Brazzaville, the leaves of both species are used to dress warts and boils, and the stem is cut-up and eaten to reduce pain in childbirth. In Cameroon, the leaves are sometimes chewed to lessen the effects of drunkenness. The supple vine is often used in rope-making. 1 Boil the cow skin with a bit of salt, maggi bouillon and pepper. Boil with a bit of water, about 3 cups, depending on the quantity of meat. Make sure it’s ready and soft. 2 Wash the eru. Put it in a colander to drain, then wash the sliced water leaf or spinach also and drain. Do not squeeze the spinach or water leaf when washing because it is slimy. Just put it in water, rinse, then leave to drain. 3 Add the water leaf or spinach. When the cow skin is ready, together with the stock fish, add the water leaf or spinach and leave for a few minutes. 4 Stir the water leaf or spinach and make sure it looks cooked. Then add the eru while stirring. Be aware that this process is very delicate because you need to make sure you don’t put in more eru than the water leaf or spinach can take. 5 Pour in the palm oil and add the stock fish if you didn’t do so at the beginning. Leave for a while to cook. Beware: DO NOT COVER THE POT! (so that the vegetable remains green). Make sure to remove all the bones in the fish before putting it in the pot. 6 Add the pepper, cray fish (ground to a dusty powder), maggi bouillon and salt. In just a few minutes, your eru is ready. 7 Serve while it’s hot. It can be served with pounded water fufu, garri, in short anything fufu made from cassava.